These are very rarely called Gray-Winged Olive Quills. 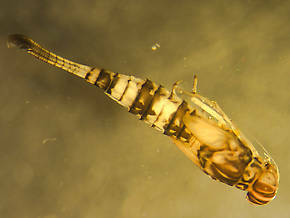 This genus is not well-known to fly fishers because most of its species were, until very recently, classified as either Centroptilum or Cloeon. 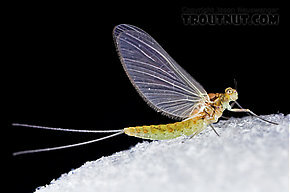 These mayflies may be abundant enough to cause fishable hatches in spite of their tiny size. It's difficult to discern from previous angling literature exactly which statements now apply to Procloeon, because its species come from other little-known genera and the accounts for them conflict. They were mentioned in combination with other genera, adding to the confusion. So the information below is highly tentative and, where accounts seem to conflict, both have been given. Procloeon pennulatum (Tiny Sulphur Dun) Mayfly Nymph View 1 PicturesThis fragile nymph is easily damaged during sampling making identification more difficult. Female Procloeon (Tiny Sulphur Duns) Mayfly Dun View 8 PicturesThis dun of a fairly large Baetidae species was one of only a couple I saw all evening.